We are still in Avatiu harbor awaiting our rebuilt injector pump, which was arriving on a flight from New Zealand today…is arriving tomorrow…or may arrive any day now. In the meantime, we have found things to occupy our time including the usual hiking and snorkeling. 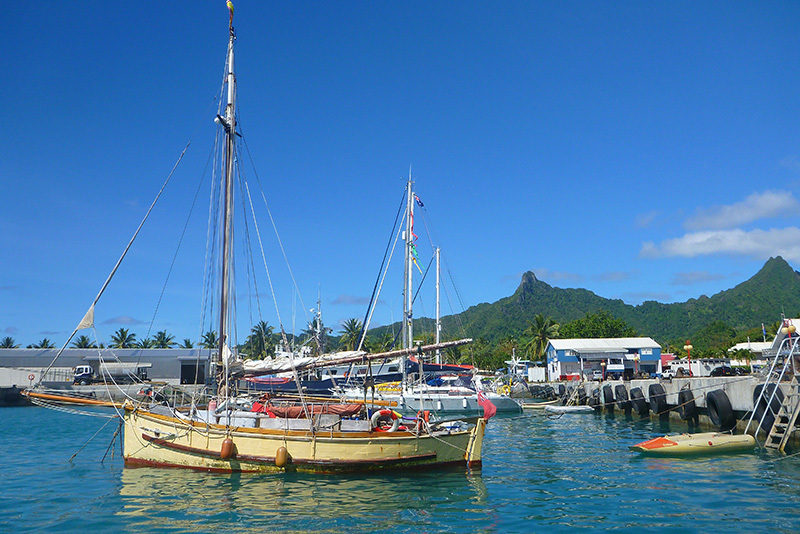 However, we have found that one of the focal points in Rarotonga is the harbor itself. Avatiu is the chief commercial harbor for the Cook Islands, and historic, commercial, and pleasure craft of interest can be found rubbing gunwales along the wharf at any given moment. 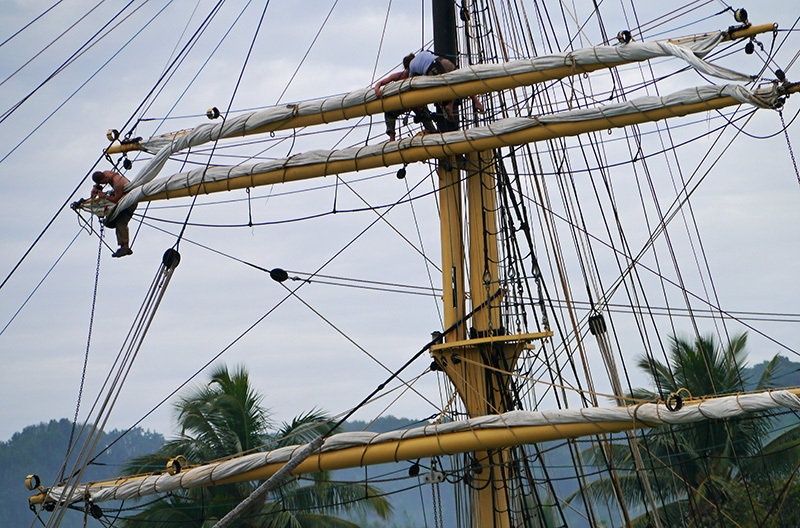 When we first arrived, this 28-feet gaff-rigged wooden cutter caught our eye. 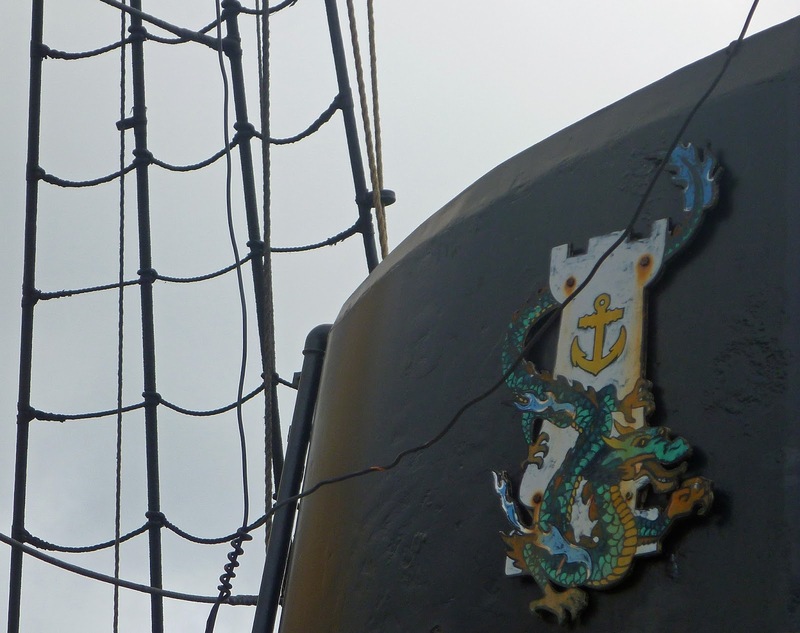 Dolphin of Leith is 108 year-old British flagged vessel, and her owners, a couple in their thirties, have sailed her across two oceans with their two children under the age of five! Their girl was a mere babe when they departed the United Kingdom. The skipper of the Dolphin, Ian, grew up on the boat---his parents were her former owners---so it is the second boat we have met that has seen three generations of family on it. The above photo shows Dolphin with her trys’l on the main boom; her mains’l blew apart on a recent passage. The guy in Rarotonga who is helping us shuttle our injector pump back and forth to/from Auckland was looking for some used sails for the Dolphin but couldn’t find any that would fit the gaff rig. 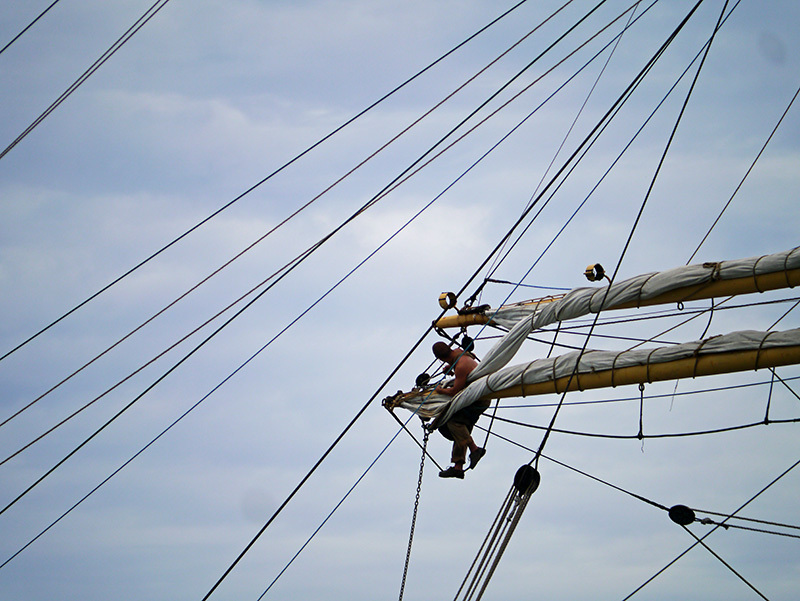 Unperturbed, Dolphin of Leith’s crew headed offshore, intending to stitch up their mainsail while underway. Their intended destination is New Zealand. While those of us left in the anchorage admired the pluck of Dolphin of Leith’s crew, we all agreed that there are risks that we would undertake ourselves that we wouldn’t subject young children (who don’t have a choice) to. 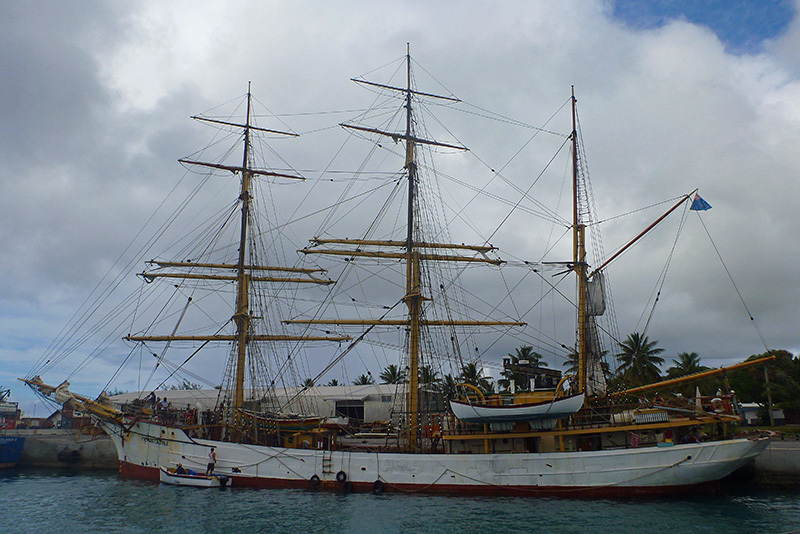 The sail training ship PictonCastle docked several days after our arrival in Rarotonga. 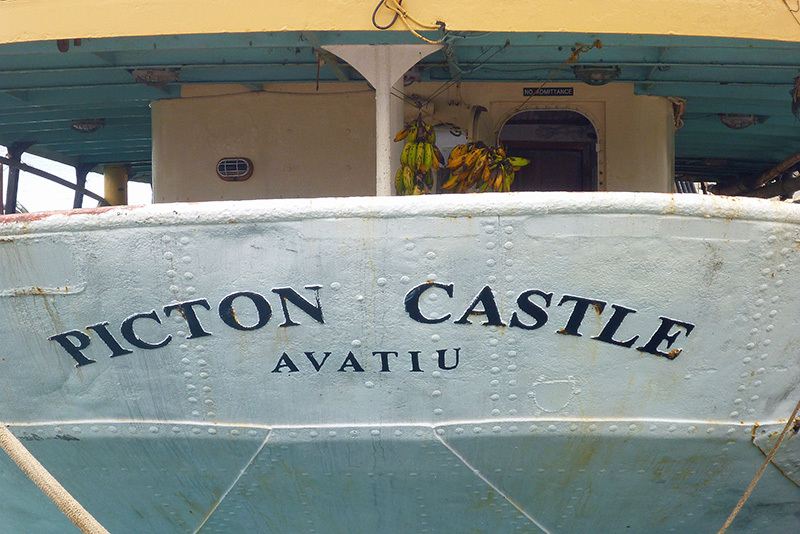 The Picton Castle was named after an actual castle in Pembrokeshire, Wales. 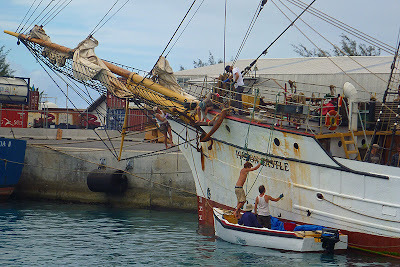 She is a converted steam operated fishing trawler that also worked as a mine sweeper during World War II. 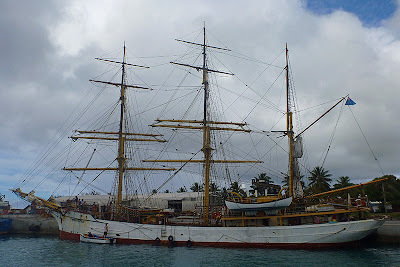 She also hauled freight for awhile after the war; thus, Picton Castle’s rebirth as a sail training ship is her fourth incarnation. Shortly after the secured its dock lines, the crew of Picton Castle were swarming all over the ship in a frenzy of activity, cleaning her up after their two-month voyage. Work continued on the ship in the days that followed. 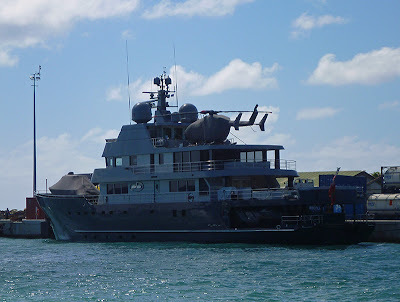 This mega-yacht came in and anchored for a few days during our stay in Rarotonga. Its name is Plan B. That makes us wonder what Plan A was? Several Chinese and Cook Island flagged fishing vessels used the port of Avatiu to offload their catches of gargantuan deep sea tuna. 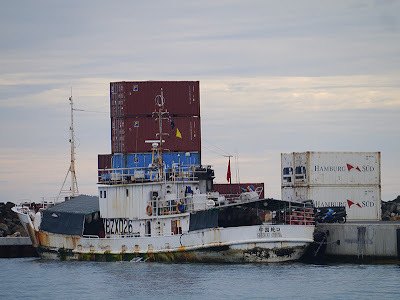 Assisted by a push from a tug, huge freighters also tie up to the wharf in order to offload containers full of supplies and machinery for the island. I didn’t get a picture of the container ship that offloaded during our visit. There is also a small boat basin adjacent to the commercial and visiting yacht wharves. There, local fishing and sailing charter boats, whale watching tour boats, and inflatables used for actual whale research are launched. So what about those acrobatics? Many of the boats that are Med moored here end up with two anchors deployed. 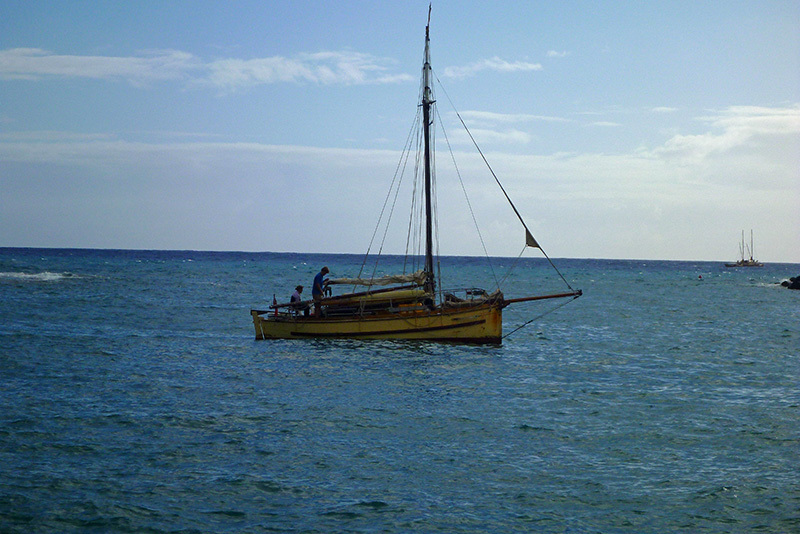 If a large swell upon entering the harbor does not inspire dropping a second anchor as insurance against dragging towards the concrete wall at one’s stern, a second anchor is often set by a yacht after discovering that their primary anchor has been fouled with the anchor of a departing vessel. 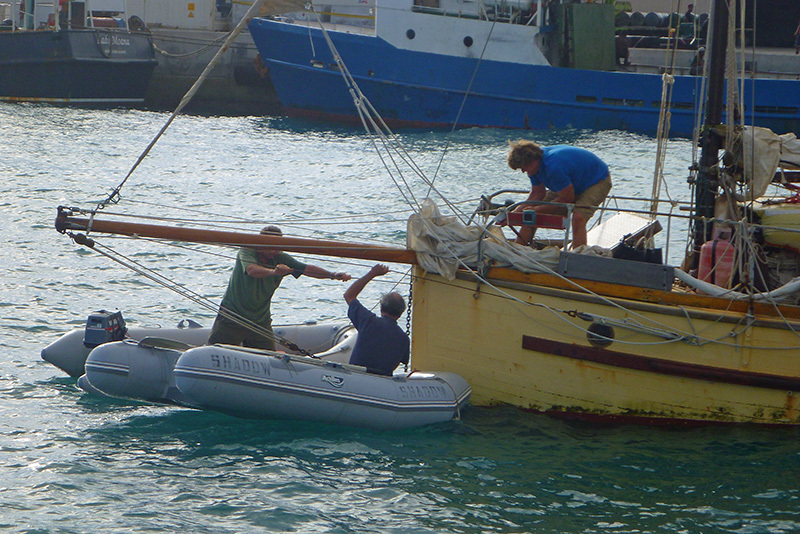 A second anchor is then deployed in order to reset the primary. In unsettled weather, Avatiu harbor is also one of the most uncomfortable anchorages we’ve been in. There are a limited number of access points (sets of aluminum stairs) where cruising yachties may climb to the wharf. The ease of reaching these staircases directly correlates to your distance from them. In Silhouette’s case, we were directed to moor almost as far away from a flight of stairs as you could get. When the anchorage is full and you cannot row around the bows of the other boats, bringing the dinghy alongside a set of stairs requires negotiating a maze of stern lines (rowing over them or pulling the dinghy under them in a hand-over-hand style.) Then, once reaching the stairs, you have to jostle all the other dinghies that are left blocking the stairs out of the way. Instead of exiting a dinghy and then moving their bow painter down a rung or two to tie up, people tended to leave their dinghies right at the foot of the stairs, making it difficult for others to exit via the steps. 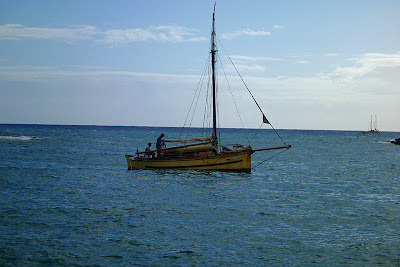 When the anchorage is choppy and rolly, or you are transferring fuel, water, groceries, or laundry, all of this becomes a more awkward (and a wetter) proposition. There is only one water spigot located on the east end of the dock; and again, depending on where you are moored, it would require three to ten 100-ft. hoses strung end-to-end to fill your tanks using the spigot. (Rumor has it that piped in water for each berth is coming as soon as they finish piping in the rest of the island’s water supply.) The “Palace Takeaway Restaurant” at the west end of the wharf has been generous about allowing yachties to use their water spigot---they also make a decent burger and great chips and are a favorite hangout for locals---however, the distance from a boat to the spigot is still an issue. 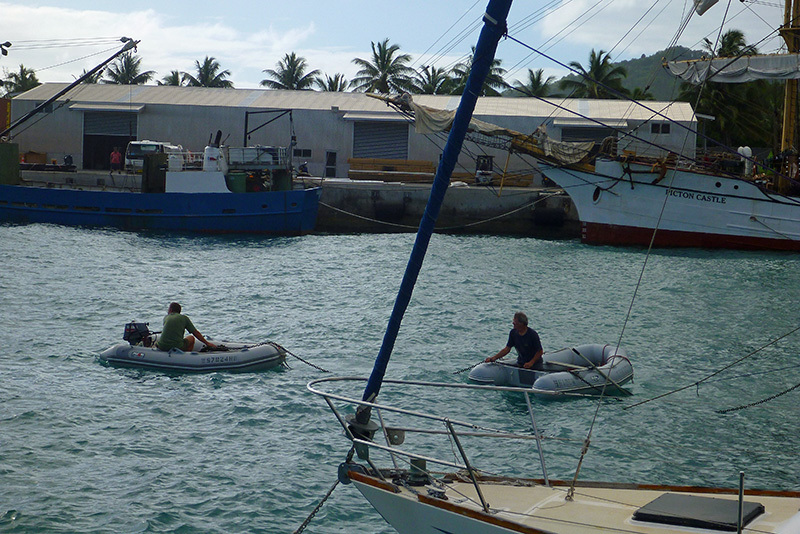 It is advisable to come in to Avatiu with full water tanks if possible and only have to top off using jerry cans. We have been lucky with the weather. At worst, the wind has blown out of the northeast, making the anchorage very choppy and causing the Med-moored boats to hobby-horse dramatically. If the wind had blown hard out of the north at any time during our stay, we would have had to put to sea and return for our injector pump later. 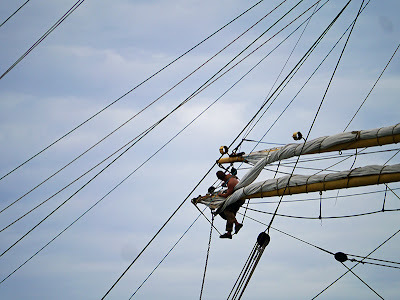 I asked the harbormaster at what wind speed (from the north) would he recommend that vessels leave the anchorage? He replied that it is up to the comfort level of each vessel’s captain. However, he continued, the point at which he himself asks people to leave the harbor is when the waves are topping the sea wall at the vessels’ sterns. 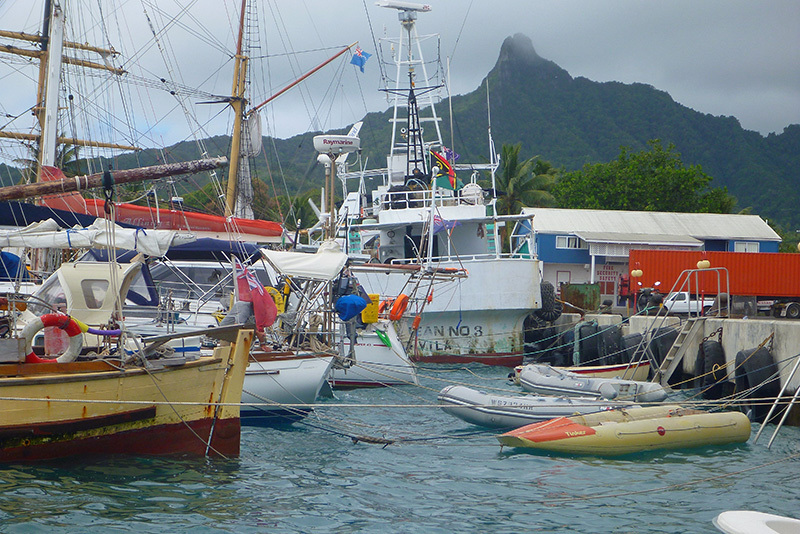 Avatiu harbor is a vibrant and interesting harbor, but anchoring here can be stressful if a quick exit is not on the agenda.